I hadn’t realised during reading this book that I was actually reading a painting. 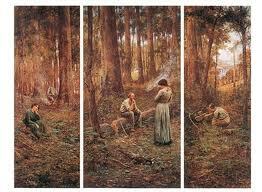 Here it is- McCubbin’s triptych “The Pioneers”- how could I have possibly missed the allusion? The book opens with Mary Cameron, standing in the bush beside their wagon, desultorily feeding a smouldering campfire with sticks of eucalyptus that she breaks in her hands or across her knees. She goes to a fallen trunk, sits down and gazes into the shadows. The book closes with her grandson pushing the bush away from a “lichen-grown wooden cross”, dropping on one knee to read the inscription. Ah- I thought- “The Pioneers”- of course! The Pioneers won the Hodder and Stoughton All Empire Literature Prize for Australia in 1915. It is not hard to imagine why: for a British publisher the book is steeped in eucalypts, pioneer spirit and optimism exemplified by the young colonial soldiers of the Australian Imperial Force in WWI. Although its author became (in)famous for her heavy Communist Party involvement in later decades, there’s a nationalistic pride here that I, at least, find difficult to reconcile with the internationalism of her later politics. Perhaps it was prompted by the circumstances in which it was written- by a young Australian journalist based in England, drawing on the notebooks she had penned recording the old-timers’ stories during her own time in Gippsland several years earlier. It’s all there- the silence and forbidding beauty of the bush, the old convicts, the cattle-duffers and the bushfires- but there’s also a defiant pride in the generation that followed the pioneers, who threw off the shame of convictism that haunted their parents and grabbed the opportunities open to them. There’s a White Australian debt to be acknowledged to the pioneers on the frontier, and a romance and optimism about the “currency” lads and lasses growing up tall, proud and resourceful – who wouldn’t want to embrace that? I often find it hard to talk about “old” Australian books and authors. There’s often a mawkishness and blatant nationalism that I’m not comfortable with as a reader. I find myself wondering if the incorporation of such books into the “Australian Classics” canon subjects them to a critical scrutiny that their targeted audience of the time might not have shared. For example, a review of The Pioneers at the time noted that “the setting of romance is said to be very attractive to readers who are only incidentally interested in history” and then as now, books were written and published with a contemporary audience in mind- an audience with different expectations and tastes to what we might have today. For myself, I find myself being dragged back to my 21st century reader mindset because the sentimentality and melodrama of these late19th/early 20th century books overwhelms me (two exceptions: Ruth Park’s Harp in the South and Henry Handel Richardson’s The Fortunes of Richard Mahony). I then find myself reading such texts as a historian, because I’m rather discomfited by them as a fiction-reader. I’m aware that this is probably not fair on the book, or the author, or my own experience as reader. I’m particularly conscious of this because I’ve just finished reading Sarah Water’s The Night Watch (glowing review to come!) which I found much more satisfying than, say, Dymphna Cusack and Florence James’ Come In Spinner. Surely the 1950s book written from experience would have an inherent fidelity, but in terms of my emotional response, I found the more recent text, aimed no doubt at a different audience segment, and stripped of the popular melodrama and skittishness, more satisfying. Perhaps it’s the different mindset that a reader brings to reading historical fiction as a genre, as distinct from popular contemporary fiction from an era that is now historical itself? You might want to read Whispering Gums’ review of the book too. Great review RJ. You raise some interesting issues. But I think “The pioneers” is more like “The night watch” than “Come in spinner” isn’t it? It was written in 1915 about the mid 19th century. This whole historical fiction issue is a fascinating one methinks. The issue re when it is written, the period it is written about and when we are reading it? It may be more the style Prichard uses rather than the subject matter that is the issue? BTW I agree with you re The night watch (before reading your review to which I look forward). I loved it. Yes- it’s interesting that the time distance is similar for both books, and both writers had an agenda or political stance that they were privileging in their retelling (i.e. optimistic nationalism for The Pioneers; homosexuality/lesbianism for The Night Watch). And I agree about it being a matter of style rather than subject matter. In terms of subject matter, there is probably a congruence between The Pioneers and Grenville’s The Secret River. Interesting that the review in the Launceston newspaper perceived The Pioneer as history with a bit of romance thrown in- which echoes the history/fiction issues raised by Grenville’s book as well.